A log splitter has all the basic components of a hydraulic machine. It is used for splitting firewood from softwood or hardwood logs. In other words, it splits woods into smaller size which you can use for firewood. Log splitters are often rated by the tons of force they can generate. Their engine provides the power for the system to split a log. It can be either electric engine or gas powered, depending on the model. Most general log splitters for home use provide 10 tons of power. However, professionals opt for those models that exert 30 tons of force. You need a log splitter because of various reasons. Doesn't require much muscle power. Split timbers right down to kindling size. Uses pressure in a safe and more efficient manner. Protects your back and shoulder. It saves times and splits much more timber. Apart from this, if you are a person who requires firewood to heat your house on a consistent basis, this can be your best friend. The arduous task of log splitting turns into easy one. Furthermore, you don't have to pay high prices for already split firewood. You save a lot of money in the long run. Up to 25 in opening. Chopping wood is very satisfying. But, you need to have a good log splitter for that, which can reduce your working time and effort considerably. 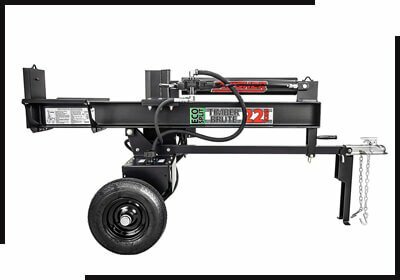 Below are the top 10 electric powered log splitters that are fast, affordable and an advanced solution for log splitting. 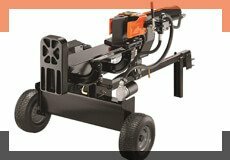 The Pow' R' Kraft 65556 4-Ton Electric Log Splitter is the perfect match for your needs. It provides 4-ton of portable power, which is more than enough to split wood easily. This product has been developed with the sole purpose of making the entire process easier. For that reason, people who require ease-of-use during indoor use, it is a perfect model for them. They can use it in their basement, garage, and even barn without any trouble. It is an electric model; therefore, you don't need to worry about the gas running out either. Just make sure it is connected to the electric socket all the time while you are splitting the woods. It splits 20" long by 10" diameter. In fact, some woods can efficiently being cut up to a 12" diameter. Besides, the best thing is its ram auto returns for the next piece. Heavy duty steel construction and hydraulic components. It has 1500-watt electric motor that runs on regular household current. It is shipped now with a new, stronger packaging. Pow' R' Kraft Company delivers it fully assembled and ready to use indoor/outdoor. ​There isn't any specific con it; consumers give it A++ ratings. The Southland Outdoor Power Equipment SELS60 transcends all the expectations. It turns days of chopping into a few hours of work. 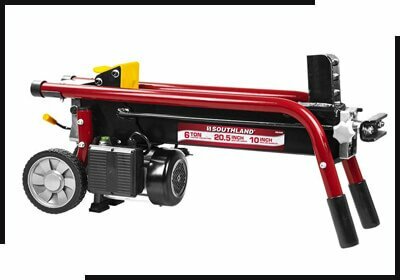 Just like the previous model, it is also an electric product by the Southland Outdoor Power Equipment Company. You don't need to deal with gas; just plug it in and let it split the woods proficiently. If you have gas splitter in the past, you won't find any special difference in it. It delivers the same speed and power. You will be impressed thoroughly. The manufacturers have introduced heavy duty 1.75 HP, 15-amp induction motor in it. And, this is perhaps the only feature that makes it the best-selling product in the market. It helps it to deliver maximum performance for the most rugged conditions. In addition, the vertical storage option doesn't take a lot of space in the garage and shop too. It facilitates in handling this log splitter professionally too. Heavy duty 1.75 HP, 15-amp induction motor. Vertical position provides maneuverability and simple storage. The customized settings can be adjusted according to the size of log. It performs rather well even in the most rugged conditions. This product can't be shipped internationally. A couple hundred years ago, cutting tree or wood was a strenuous task. However, luckily, we are living the 21st century. 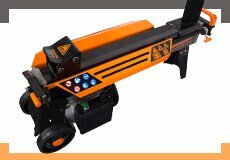 Today, we have advanced machines like 'Swisher LS22E 120V Timber Brute Eco Split' which enable us to get a lot of work done in a short time. If you count on fireplaces and wood-burning stoves a lot, you need this electric log splitter. It can be used on a standard outlet and give professional-level performance. 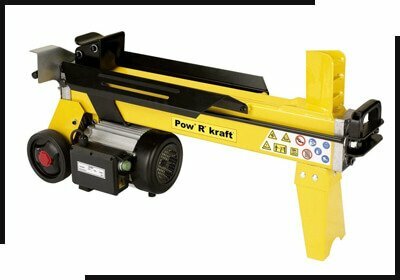 It has 120V motor with 22-ton force that provides ample splitting force. That's why, it takes less time to cut woods. You don't have to spend a lot of energy. Even seniors can control this electric log splitter rather with ease. There won't be any specific risk of getting injured against muscles and joints. Furthermore, because of its shape and size, you can easily move this unit while splitting woods in different places. Horizontal and vertical splitting position makes the entire task easy. It has 2.5-gallon poly hydraulic tank which is rust resistant. You can secure it in place with the vertical beam lock. 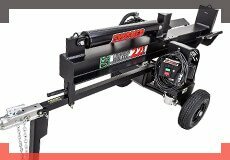 22-ton force gives ample splitting power for all wood species. There isn't any special con in Swisher LS22E 120V Electric Splitter. Using axe to cut woods? Well, stop right now and get WEN 56207 6.5-Ton Electric Log Splitter. It is a 5-star product for all those who deal with woods all the time. 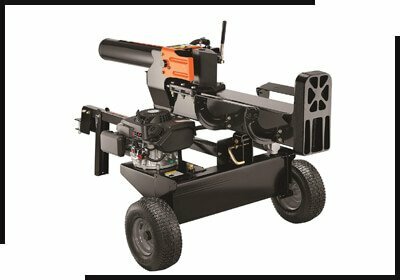 The best feature in WEN 56207 Electric Log Splitter is its 15A powerful motor. It assists this machine in producing 13,000 pounds of log cracking pressure, which is not that easy to find in other products. You feel like you have super power in the palms of your hands. In addition, it comes with 34-inch stand too. You can use the log splitter with or without it; it all depends on your preference and job requirement. Furthermore, you can easily transport it too from one place to another. There is onboard pull handle and two 5.5-inch wheels that make entire moving process simple. Even on the roughest terrains of forest, you can transport this splitter comfortably. It splits logs up to 10 inches in diameter and 20.5 inch in length. Two handed operation maximizes user safety. No need to deal with the hassles and expenses like gasoline-powered splitters. Because of its onboard pull handle and 5.5-inch wheel, you can transport easily. It can't be shipped internationally. 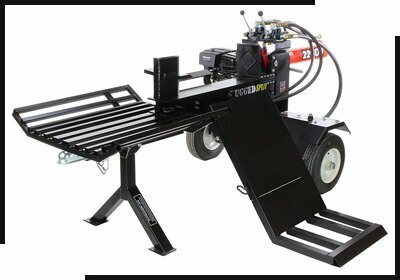 This is one of the finest electric log splitters in the market, but unfortunately due to lack of advertising most log splitter users don't know about it. 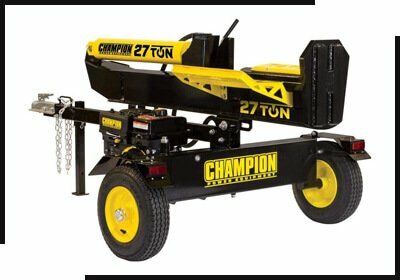 The Champion Power Equipment 27 Ton 224cc Log Splitter offers the right quality. If you are a novice, bear in mind, you have to assemble it which is rather uncomplicated. You will find clear instruction regarding the assembly in the instruction manual. They have explained everything in details, and even told their customers about the nut/bolt combinations. It features 224cc single-cylinder OHV engine, 0.9-gallon fuel tank, and 2-stage gear pump. All of them work together when cutting through a log to increase productivity. Besides, with full steam beam design, it gives horizontal and vertical splitting. The maximum log diameter is around 23.8" too, with 23.8" length. If you are still on the edge about this product, there is one thing that can end all your concerns - The Champion Company. It has the best product quality and customer service in the business. Once you opt for them, they cover you with lifetime free technical support. It gives horizontal and vertical splitting. 2-stage gear pump adjusts flow and pressure in a professional manner. The hydraulic oil system has a 5 gal. oil capacity. Champion Company back your purchase with 2-year limited warranty. You will be very pleased with the purchase; there isn't any con in it. 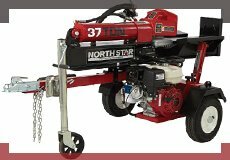 The NorthStar Horizontal/Vertical Log Splitter can also be considered the best in the industry. It is engineered, assembled, and tested by the professionals in the U.S. Besides, it is from the NorthStar Company, which is known for producing only quality products. Therefore, you can trust it and purchase it without any concerns. When we first assessed the features of this log splitter, we were quite amazed. Since, it looked like an average splitter. But, little did we know it is packed with powerful features. It has 37-ton immense power that splits any log that gets in its way. Besides, this force is generated by a Honda GX270 Engine. It supports it and takes its performance on a grand scale. If you have used any log splitter before, you will notice a clear difference, not only in performance, but also in many other things. For example, its engine saves more fuel than other log splitters in the market. Moreover, the GX270 Engine also assists in reducing the noise while you load the next log. It splits log in both vertical and horizontal position. Saves time, more fuel, and word effectively in the long term. Its backbone is industrial-strength I-beam with heavy plate steel reinforcement. It is protected by a quad filtering system. It will only handle logs up to 2 feet long. It is a top-quality electric firewood splitter. You can prepare firewood with ease in the least amount of time, compared to other products. Several satisfied users of Powerhouse XM-380 Electric Hydraulic Log Splitter state that, with this log splitter, you can split more than 100 logs in less than an hour. Moreover, one of the finest features is you have to operate it with two hand. It eliminates the possibility of any injury. According to the manufacturers of Powerhouse, you can split 20-1/2-inch-long 12-inch diameter log in less than six seconds. If you are a novice or wish to buy something for a hobby, you will definitely love this product, as it doesn't require assembly. You don't have to read the instruction manual in order to operate it. Just plug it into the socket and it starts splitting. Lastly, and most importantly, it is not only for beginners. Even professionals prefer it over other models as it is from the Powerhouse Company, which is a reputable name in the industry and known for its contemporary designs. You can split hardwood in no more than 6 seconds. You can use it either on the ground, inside, or outside. Two-hand operation eliminates the chances of injuries. It has a motor of 3HP 7-ton 2500-Watt 3500PRM. Some users complain that it doesn't split green wood well. 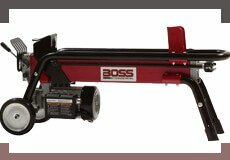 Put an end to long and tedious log splitting and get Boss Industrial ES7T20 Electric Log Splitter. It is really a boss when it comes to splitting the logs. It has an automatic ram return system that gets the job done quite quickly. In addition, it provides 7-tons of power, which is more than enough to split almost all variety of woods. 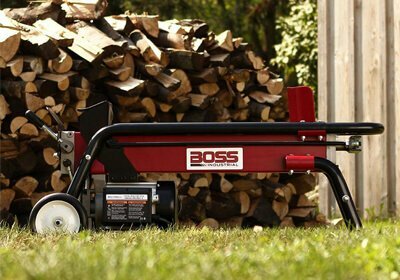 Though, many popular log splitters don't work well when it comes to splitting the green logs, but luckily this isn't the case with Boss Industrial ES7T20 Electric Log Splitter. It cuts the dried and green logs effectively. However, there is one con in it as far as we have assessed its performance. It struggles against the knotty logs. You will notice some unevenness in the cuts. And, it is probably because it is tough to keep the knotty logs in place. The Boss Industrial Company protects its customers' investment by providing 2-year residential and 180-day commercial warranty. This splitter has a powerful 2 HP electric motor that produces 7 tons of force. It offers convenient one-handed operation. It cuts dried and green logs better than many other electric log splitters. Easy push button electric start makes it easy to start splitting. It is not 'that' effective against the knotty logs. 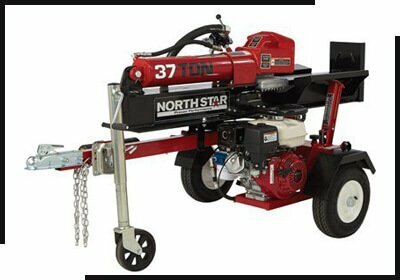 Though, it is a gas log splitter, but it has 212CC electric start. The design of RuggedMade 22-Ton Push Through Gas Log Splitter defines everything in its name. It is a push-through design; however, the blade is welded to the end of the beam. Apart from this, the manufacturers of RuggedMade cleverly engineered it. They kept the beam at waist-working height in order to save your back. This log splitter is famous as one of the most powerful splitters in the market, particularly because of its 22-ton push force. Since, most other splitter doesn’t provide that much power. But, just because of this feature, even the experts choose it for difficult task. According to them, it is not just the force that makes it the finest product in the market; its 212CC engine with heavy duty 13GPM 2-stage pump too that plays a significant role in its performance. It transforms it into a perfect outdoor power equipment. It is specially built for outdoor specialists. It has 22-ton force power with 212CC electric engine. The split wood conveniently drops into the catcher tray. It splits logs up to 18" diameter and it is quite fast as well. Its assembly takes a tad more time than other log splitters. The OrionMotorTech 2200W 7-Ton Electric Log Splitter takes the hard work out of chopping logs. 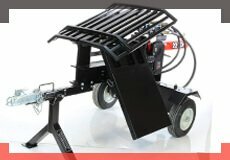 It is one of those products that not only gets the job done quickly, but also performs industrial level tasks professionally. This splitter uses 7-ton splitting force. We agree, it doesn't look powerful enough, particularly for industrial use, but there are lots of other feature that adds power behind this force. For example, it has 2200W 2 HP powerful motor that produces 2950RPM speed for splitting logs. It is sufficient enough for professional-level performance. Other than that, the developers of this product attempted their best to extend its service life. Therefore, they utilized heavy duty cast-iron splitting wedge for efficient and top-notch splitting. In addition, they introduced built-in wheels in it too for easy transportation. You can move it on different terrains for quick and powerful splitting of logs. The OrionMotorTech Company also guarantees free exchange if you receive defective product. This is a special bonus that protects consumers' investment. We believe, other companies should follow this too in order to build trust and elevate their reputation. It has 7-ton splitting force and hydraulic oil system. Automatic design for easy operation. It is backed by 2-year warranty for worry-free shopping experience. Two handed operation design maximizes user safety. There isn't any specific con in it. 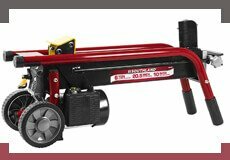 Gas-powered log splitters are also quite common and popular in the industry. They work almost same as the electric models. The only difference is their hydraulics are powered by gas or oil, not electric motors. When we compare them with electric splitters, they perform a lot better. The force they generate is amazing, which can be used even for the most difficult tasks. 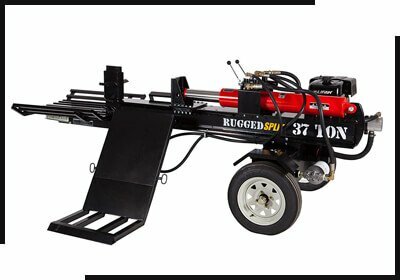 Below are the top 4 gas-powered log splitters in the market. Split Logs Length: Up to 30 in opening. Split Logs Length: Up to 25 in. This model features a Southland OHV gas engine. It is one of those high-level products that industries use for splitting even the most demanding types of woods. Since, the engine of Southland outdoor Power Equipment SLS20825 gives maximum performance (25-ton force) even in the toughest conditions. It also comes with horizontal and vertical splitting position. If you are a person who can't lift the logs, you can change its position and roll them under the wedge. It will do its splitting job effectively with a 17 second cycle time and automatic return. The developers of this product introduced 'Internal Oil Delivery' system in it. You can use extra lubrication in it to extend the engine life and reduce heat which builds up after using the splitter for a long time. Furthermore, in order to increase its maneuverability, they have added 4.8 inches wheel in it. You can move it and split woods near the woodpile. It offers 25-tons of power for maximum performance. It is a versatile gas-powered splitter which switch positions horizontally & vertically. 4.8" wheels provide maneuverability to split woods. You can provide extra lubrication to its engine to extend its life. Assembly takes a tad more time, but there is a video too with clear instructions. It is a very nice compact splitter. You can run it for hours without any trouble. It performs its work flawlessly and splits logs powerfully. From pine to oak, you can split any wood with it. 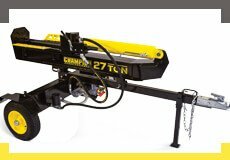 The Champion 7-Ton Compact Horizontal Gas Log Splitter features integrated log cradle and low profile for ease. It is not easy to find this feature in the models of its kind. But, this is just the tip of an iceberg. Professional developers of Champion Power Equipment supported this gas-powered model with 196cc Champion OHV engine. 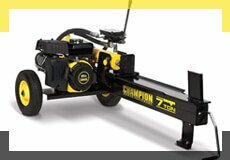 It reliably starts on the first pull and assists in delivering quick, dependable, and portable log splitting. 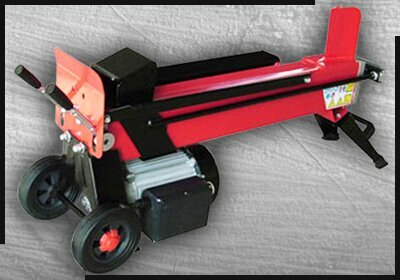 There are many other features that make it a top-notch log splitter in the market. For instance, it is capable of up to 180 cycles per hour. Moreover, it is specifically designed for easy loading of heavier logs and improving splitting efficiency. It is powered by a reliable Champion 80cc engine. Efficiency; it gives 20 second cycle time or 180 cycle per hour. It is portable because of its handle and tires; you can move it with ease. This splitter is engineered to provide power in tough working conditions. It requires more hydraulic oil to run smoothly. Fortunately, in these modern times, we don't need to use an axe for splitting logs. Today, we have a superior option to keep our home fully stocked with wood - RuggedMade 37-Ton Horizontal Gas Log Splitter. It is affordable, strong, fast, and durable. And, if you deal with larger sized logs on a regular basis, it will astonish you with its performance too. Though, it depends on your requirement, but this RuggedMade model is a blessing even for professional companies. It delivers immense 37-ton force with 15HP 420CC Engine. You can split almost all kinds of woods whenever you need. It looks bigger in size in the first glance, but in reality, it is a compact size machine. Its log lift and catcher actually give it a larger look. You can remove them or reattach them whenever you want. There are locking pins to facilitate towing and storage. It splits log up to 24 inches in diameter and 30 inches in length. 37-ton gas log splitter with 420CC engine. It has a perfect waist working height to protect your back. It splits wood conveniently up to 24 inches in diameter and 30 inches in length. 5-inch welded cylinder, 30-inch stroke, 3.5-inch rod. Don't go on the size of Remington RM20 Sequoia 159cc Log Splitter. It is powered by an immensely powerful engine that produces 20-tons of RAM force. This kind of force is ideal for splitting large amount of woods on a consistent basis. Perhaps, that's why, people who encounter big tasks often rely on it. It is powerful and faster, and it is specifically effective for the freshly fallen logs too. 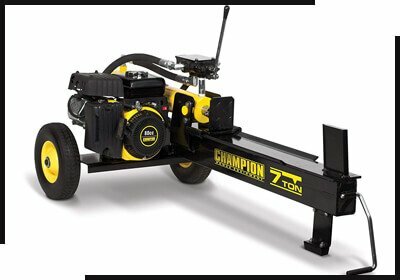 Besides, unlike many other gas-powered log splitters, it already comes with premium hydraulic fuel. You can start working on your splitting task right away. This unit also provides the flexibility of changing positions; you can split logs vertically and horizontally. Why is this product not that popular in the market? Well, if this question is revolving around your mind, it is only because of its price. After canvassing its feature extensively, we believe it is priceyer compared to another gas-powered log splitter. The Remington Company should lower its price if they want to compete with other great products in the market. It is powered by a 159cc OHV engine. Comes pre-filled with premium hydraulic fuel. Can be used horizontally and vertically. Delivers 20-tons of immense RAM force. It is expensive, but it's worth it. 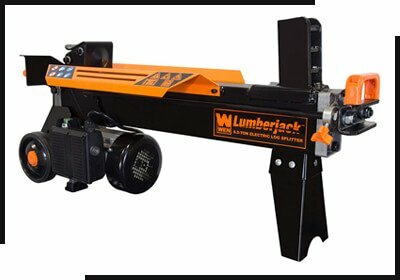 There are many types and styles of a log splitters that offer log cutting solutions of highest quality and reliability. You can categorize them in the following ways. These splitters aren't in our list above. But, you will find them in the market as well. They aren't powered like other log splitters, but they do provide more force than a hammer. You've two options in them; some splitters are foot powered while others are hand powered. They are a great tool specifically for those who need woods occasionally. 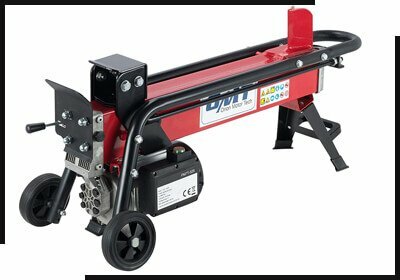 Manufacturers of manual log splitter use hydraulic pressure in them also in order to generate enough power to tolerate slightly larger amounts of wood. And, just like other models (electric & gas powered), they also assist in horizontal/vertical cutting. 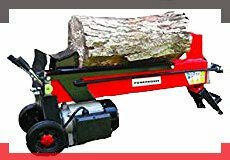 Electric log splitter are currently the new trend. They are the blank check of success for the manufacturers as people from all walks of life are opting for them. The average force they can exert is between 4-10 tons, which is enough for a hobby or occasional use. However, there are some expensive electric log splitters in the market too that generate more than 20-tons of power. Even the industries use them for tough conditions. The main advantage for these splitters is you can use them anywhere that has power. They are quiet and one can use them indoor too when the weather is poor outside. Gas powered splitters don't require electricity. They count on gas or petrol which puts them in a much higher range than electric splitters. People in this industry calls them the largest and most powerful, particularly for outdoor works, like in forest and etc. They generate tons of pressure which is perfect for professional use. However, it doesn't mean one can't afford it. You can have a great gas-powered log splitter in a quite economical price. The only downside is they require oil changes, filter changes, and plug replacements on a constant basis. In other words, they become expensive in the long run. They aren't as popular as the gas powered and electric powered splitters. And, they reason is they are specially designed for professional use. Bear in mind, these machines are referred to as 3-point log splitters too. They are quite large in their size, as the name suggests. People transport them by towing them behind the tractor. Almost all large hydraulic splitters are immensely powerful and get into the highest tonnage ratings. They can cut all the woods; it doesn't matter whether they are green or seasoned. If you want power and capability, they are for you. But, if you are planning to buy them for small family needs, we won't recommend them. You should opt for electric model instead. 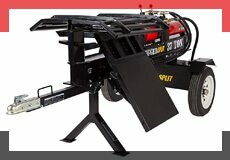 On the whole, these are the most popular types and styles of log splitters. It is up to you to decide how much power you need. For occasional or rainy-day fire, get an electric one or gas one. But, for professional consistent use, large hydraulic splitter is perfect. A log splitter consists of different components. Before buying a splitter, it is imperative to know about its major parts and their importance. 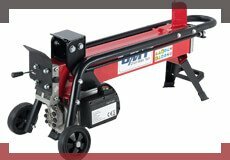 This will assist you in choosing the best log splitter for your exact needs. Without the engine, a log splitter is good for nothing. It is the key component in the machine that supports the power and make it run. This is the first thing you should consider while assessing the feature of a splitter. Check its ability to perform on both large and small projects. Also, make sure it can maintain its powerful performance in the long run. Since, some engines provide more than enough power in the beginning. But, after the first few hours, or days, they begin to lose power and performance. Companies like Southland, Champion, and NorthStar are famous for developing great engines in splitters. In simple words, it is actually the mechanical source of power that converts its power into hydraulic energy. It is the heart of log splitters as it facilitates in producing desired operating pressure and cycling time. Though, most beginner don't know a lot about this equipment, but professionals focus on this feature in a tad more detail, as they comprehend it is significant to calculate how it matches up to the motor. Besides, the life of the splitter depends on this aspect too, because they don't want machine to create over pressure on it. The hydraulic pumps are either a single-stage or two-stage pumps. ​There is a key difference between Hydraulic Pump and Hydraulic Cylinder; they aren't the same. This equipment of the machine has many applications. It creates mechanical force in a linear motion. However, it needs to have the correct amount of fluid volume and pressure in order to create the exact force which the log splitter needs. Therefore, it is correct to say that the effectiveness of a splitter highly counts on it. According to experts, if you want to assess the effectiveness of it in the log splitter make sure its tonnage rating is not below the hydraulic pump tonnage rating. Log Splitter Wedge is also known as 'Splitting Head' in the market. This is another main component to consider before buying a log splitter. We know, most log splitter companies don't shed light on it on a great scale in the descriptions, but we believe it deserves all the attention like Engine, Hydraulic Pumps, and etc. The splitter wedges are available in different types, but you can categorize them in three main categories - Two Way Splitting Wedge, Four Way Splitting Wedge, and Six Way Splitting Wedge. So, make sure you are getting the right splitter wedge in the log splitter that can match your needs. Choosing the log splitter isn't an easy task. If you want to choose the best log splitter for your need there are a few features you should be looking for, such as types. 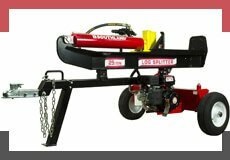 Log splitters are available in different types like manual, electric, and gas. All of them have their own advantages and disadvantages, which we have explained in the section above. However, there is one aspect in these types which you must consider. They are available in 'Horizontal' and 'Vertical' style too. Horizontal splitters are smaller and they are excellent for domestic use. You can use them on the floor or on the stand also to match the height you need. Most of them in fact already come with a stand for your comfort. On the other hand, vertical log splitters are actually suited for bigger tasks. That's why, most industries and experts opt for them as they can split larger logs or higher volumes. If you want to opt for them, make sure you have enough space to store them as they generally take more storage space and they are difficult to move too. It should be powerful enough to get through hard work without straining. It doesn't matter whether you are buying splitter for normal use or professional use, always opt for that motor that can handle the toughest jobs. Besides, don't forget to check some other aspects in it, such as RAM splitting force, amps, and total horsepower. The length of the log on which you work can also determine the choice. Can the log splitter, which you are planning to buy, accept the correct diameter and length of the log? If it doesn't it isn't for you. Place your hands on that model which can accept more than enough wood size so that you can stay out of trouble even in the future. 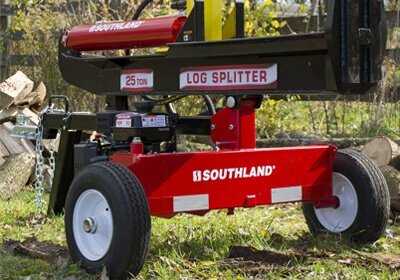 Every log splitter is different with its own power capacity. We know, most people try to opt for higher power, but remember that high power means more weight and size. It will be difficult for you to transport it for outdoor work. Don't forget about the safety (research on injuries) too. It should be a primary concern. 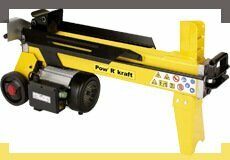 Manual machines give the best safety as it is unlikely to suddenly crack the wood or deal with flying pieces of wood. But, the electric splitters are the next-safest too. In the electric models, the power is a lot less then gas-powered. Therefore, there isn't often any chance of flying pieces of wood in different directions. You are protected.